After easing us back into the season with last week’s lackluster outing, This Is Us finally circles around to that big reveal from the mid-season finale: Nicholas Pearson is alive and living in a trailer in Bradford, Pennsylvania. As I wrote in my review of that episode, it’s a twist that threatens to break the fabric of the show. The Pearsons have already been through so much twisty turny drama over the years that shoehorning one more thing into their past threatens to be the straw that breaks the camels back. Worst of all, it could also open up the floodgates to a world where This Is Us just keeps adding more and more secret relatives as time goes on, a la Grey’s Anatomy. But given that This Is Us has committed to this “Nicky is alive” storyline, all that remains to be seen is how well the show handles. And when it comes to “Songbird Road: Part One,” the answer is… pretty well? This episode at least makes the smart choice to use the Nicky reveal as a chance to interrogate Jack Pearson as a character. That’s something This Is Us has been doing ever since its first season positioned Jack as a bit too much of an imperfect saint. But “Songbird Road: Part One” is the show’s most overt critique of Jack Pearson yet. As the present day Big Three take a road trip to visit Nicky, Jack does the same in 1992. 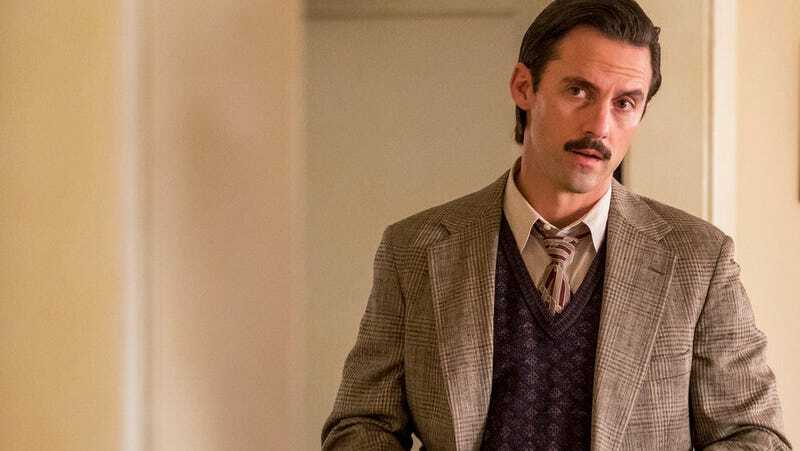 And both storylines give This Is Us a chance to weigh in on the flaws beneath Jack’s perfect facade. A lot of this episode is also just about filling us in on logistics: Despite semi-regularly sending his brother postcards, their 1992 meeting was the first time Jack and Nicky spoke to each other since the war, and the last time they ever spoke at all. In fact, the Big Three have to be the ones to tell Nicky that Jack is dead. And while that means Nicky never got a chance to tell Jack what actually happened in Vietnam, he does get to tell the story to Jack’s kids. It turns out the boat explosion from the mid-season finale wasn’t an act of malice or a suicide attempt. It was just a really dumb, really irresponsible accident. Back on drugs after Jack’s attempts to get him clean, Nicky tentatively bonds with a local kid (the son of the Mystery Village Woman from Jack’s photo). He then decides to take the kid grenade fishing, which leads to an accident where a grenade gets dropped and Nicky can’t communicate that the kid needs to jump off the boat. In the end, Nicky survives and the kid doesn’t. As has been the case all season, the Vietnam War stuff feels like it comes from a better, more mature, more cinematic version of this show. Michael Angarano is really great at conveying the begrudging affection Nicky develops for the kid, as well as the general detachment Nicky feels—both because he’s high and because he’s so disillusioned with the war. It’s almost immediately clear what’s going to happen once Nicky gestures to the box of grenades on the boat, and the episode mines an impressive amount of tension as it builds up to the inevitable. Jack’s big heroic swim and the boy’s mother’s heart-wrenching reaction are also beautifully rendered. And the show creates a complex moral situation wherein the boy’s death is an accident for which Nicky is very much at fault, but one without the malicious intent Jack assumes it has. Jack never gets to learn the full truth of the situation, however, because the boy’s death becomes a permanent breaking point in his relationship with Nicky. As this episode drills home, Jack’s can-do spirit—which has so often been presented as a strength—has its downsides too. He sees the world in black and white, to the point where he can’t even acknowledge that shades of grey exist. As Nicky puts it, Jack picks a direction to move in and never looks back. That Jack was willing to go to such great lengths to save Nicky—including enlisting in the war in the first place—only to be able to so decisively cut him out of his life speaks to some pretty intense psychological issues on Jack’s part. That’s also true of the way Jack maintains the life-long lie about Nicky’s death rather than face the truth of the situation. This Is Us has been dancing around the idea of repression as Jack’s biggest flaw for some time now, but it’s really brought front and center here. And “Songbird Road: Part One” (named after the street on which Nicky lives) is at its most nuanced in the way it observes how Jack’s bullish commitment to repression creates a situation wherein everyone around him is forced to follow suit. Nicky and Rebecca both have moments where they briefly try to start a difficult conversation with Jack before he shuts them down with a forcefulness they find impossible to refute. It’s a reality present day Rebecca is just starting to fully grapple with as she comes to realize just how much her husband kept from her. For as warm and caring as Jack could be, his emotional suppression had wide-reaching consequences on those around him. A big part of the way Rebecca parented after his death (and a big part of the way the Big Three act as adults) seems to have been shaped by the legacy of emotional repression Jack left behind. Because this is This Is Us, the Big Three walk into a situation where Nicky is at his absolute lowest, with a gun sitting on the table next to him. That they arrive just in time to stop Nicky from hurting himself is a little bit of a hackneyed storytelling choice, but the final scene is elevated by the fact that this Nicky storyline just might be the most emotionally difficult material This Is Us has ever tackled. For as much as this show loves exploring tragedy, it generally offers its characters a decent amount of emotional closure too. But Nicky’s story feels different. No matter what kind of closure Nicky winds up getting from the Pearsons, nothing will ever change the fact that his beloved older brother died thinking he was a murderer. That’s some intriguingly dark material for the show to explore. Jack and Nicky are both men shaped by the Vietnam War—Nicky because he couldn’t leave it behind and Jack because he refused to acknowledge the life he led before and during the war. I’m still not sure that the pros of this “Nicky is alive” storyline will outweigh the cons, but it’s good to know This Is Us has something to offer beyond just a twist for a twist’s sake. Griffin Dunne seamlessly builds on Michael Angarano’s work to craft an older, even sadder version of Nicky. Recasting Nicky with an older actor is a decision that works really well when he’s paired with the Big Three, but I’ll be curious to see how it feels when he’s playing opposite Mandy Moore and Jon Huertas in old age makeup. Relatedly, I’m very, very curious to see how Rebecca and Miguel are going to handle meeting Nicky. I understand Jack lying to Rebecca and their kids about Nicky’s death, but my bigger logistical questions have to do with everyone else in his life. Jack’s parents must have known Nicky survived, right? Does that mean Rebecca never met Jack’s mom (she says in “Brothers” that she never met Jack’s dad before he was on his deathbed)? Or did they meet and Jack told his mom to lie about Nicky? One utterly delightful detail from this episode is that Randall is entirely unphased by the whole Nicky thing because he has a lot of firsthand experience tracking down long-lost relatives and dealing with parents who kept major secrets from him. The elementary school-aged (I guess middle school-aged, now) Big Three look so much older! I’ll be curious to see what the show does as its flashback cast continue to age. Will we get high school stories with those actors while the original high school Big Three are aged up to college and beyond? Will we get a new child cast if the show wants to delve back into the Big Three’s elementary school years again?